Feeding tubes save lives and are not used as often as they should be for anorexic patients. 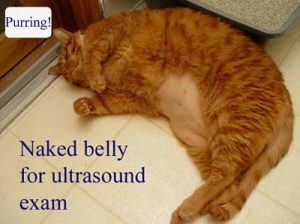 Unfortunately, when most people hear the term “feeding tube,” they tend to panic – feeling like this is the end of the road for their cat. However, feeding tubes should not necessarily be viewed as a doom and gloom overly heroic measure. Unfortunately, these folks are not recognizing the tremendous value of feeding tubes to support ill patients while they heal from a temporary illness or injury. Most cats are not bothered by the tubes at all! The human is the one who is bothered by it as the cat just goes about its daily routine. 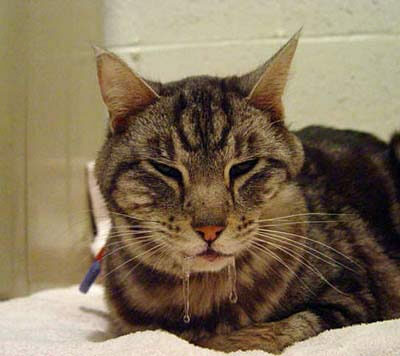 Anyone who has ever tried to syringe-feed an ill cat for very long recognizes the stress that is involved for both the cat and the human. Not only is it very time-consuming, but the critical issue is that it is often very difficult to meet the caloric and hydration (water) needs of the cat with this method. Feeding tubes are not right for every situation and case selection requires thoughtful consideration – keeping the patient’s best interest in mind – not the human’s. 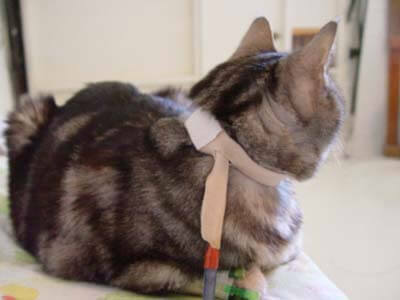 For cats that are suffering from a chronic, terminal illness such as renal failure or cancer, it is my feeling that a feeding tube is not necessarily appropriate to use in these cases. 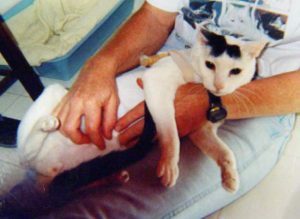 It is a matter of personal choice to prolong the inevitable in our pets and caregivers need to think long and hard before they put a feeding tube in a patient with a terminal illness when euthanasia may be a much more humane and loving decision to make. Feeding tubes do require a short period (~10 minutes) of general anesthesia to place and this is often a concern when the patient is very debilitated. This is why it is better to put a feeding tube in an anorexic patient sooner rather than later. See below for some pictures of feeding tubes that can be used to greatly reduce the stress to both the feline patient and the human caregiver. Please note that most cats don’t even notice them and they can eat and drink with them in if they choose to do so. The first tube that is shown is a pharyngostomy (“P”) tube. It goes into the side of the neck as shown and enters the back part of the oral cavity and then heads down the esophagus. 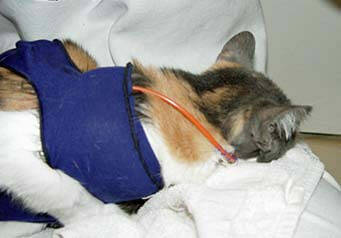 Most veterinarians prefer to use an esophagostomy (“E”) tube which goes in lower down the neck. Either tube works well but E tubes are the most common feeding tube used. Another type of feeding tube is called a PEG tube and is shown at the bottom of this page. This type of tube takes more expertise to place and must stay in for a minimum of 2-3 weeks unlike P or E tubes which can be removed at any time. PEG tubes also have a higher risk for complications associated with them. Each case has to be considered individually when deciding which type of tube to use. 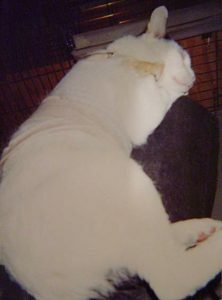 May 2006: Poor Chase (abandoned by his owners) was very sick with hepatic lipidosis (“fatty liver” disease), pancreatitis, and IBD. His hepatic lipidosis made it critical that he receive adequate nutrition to save his life but given his illness, he was unwilling to eat. If syringe feeding was attempted, he would salivate copiously and would not swallow the food. (Note the thick, ropey saliva coming from his mouth in the picture below.) 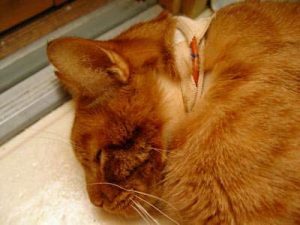 It would also trigger more vomiting causing a great deal of stress for both of us so a feeding tube was put in place and he was fed a very small volume of pureed canned food every 2 – 3 hours. It is highly doubtful that he would have survived without a feeding tube. You can see the tip of it hanging off to his right. Chase did vomit many times with this tube in place but, fortunately, the tube never came up which can be a complication when feeding tubes are used in vomiting cats. September 2006: Chase is now healthy and in a loving home. November 2011: Chase is still healthy and happy. 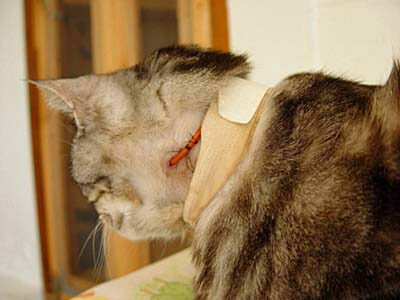 Here you can see the tube entering the side of his neck and the sutures holding it in place. This area needs to be kept clean and neosporin, or another antibiotic ointment, applied. Above and below are two pictures of a makeshift collar that I used to keep Chase’s tube in place. It is fashioned in such a way that it will breakaway if caught on anything. You can also use body wraps like shown below but if the weather is too hot, I prefer to just use a safety type of collar. Another option is to order a Kitty Kollar which is designed to use with a feeding tube but, honestly, I do not like this product. It is far too bulky. I tried one of them on my own cats and ended up cutting the fabric open in several places and, using needle nose pliars, I removed all of the bulk stuffing. But even after all of that, I still did not like the collar and went back to my thin, non-bulky homemade collar. Chase would never have had the pleasure of wearing his Santa hat had it not been for a feeding tube. This very handsome boy posed for this picture December, 2006. 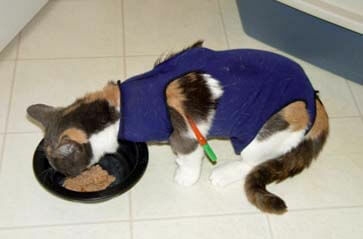 Here is Misty with her feeding tube in place after she had to have a kidney removed. 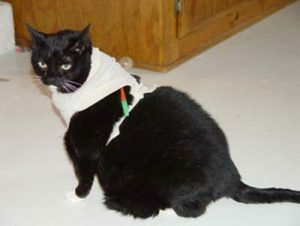 She is wearing a ‘Critter Wrap’ that held her tube in place but these wraps are ‘overkill’ and they keep the cat too hot and do not allow them to groom themselves…and basically annoy the heck out of the poor cat…..so I prefer to use my homemade collar. Molly was extremely obese and it was drastically affecting her health. She could barely walk and could not clean herself and was, in all probability, headed for diabetes. The problem was that she absolutely refused to eat canned food and getting her on a healthy diet was her ticket to a happier and healthier life. She had already been returned to our adoption agency because of her lack of cleanliness. Molly was being fed a small amount of a very low quality and species-inappropriate diet of Hill’s dry r/d and a shock collar was being used to keep her away from her housemates’ food. Since dry food is a very unhealthy and illogical diet for a carnivore and is the type of food that led to Molly’s debilitated physical state, it was critical that she be transitioned to a canned food diet. Molly looks grumpy in the picture above but she really was a very sweet and gentle little girl. Shortly after these pictures were taken, I figured out how to make a nice breakaway collar so that she would not have to wear this awful dress. As you can see by these pictures, a feeding tube does not restrict their activity. 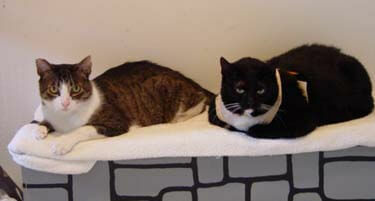 Molly was able to hang out with her buddies like a normal cat. “It is with great sadness that I announce the passing of our sweet Molly. Molly was a very special girl. She was incredibly kind, affectionate and very gentle. Molly was a wonderful companion to Maurine’s 90+ year old mother – providing Mrs. H with great comfort in her remaining days as the elderly woman dealt with advancing Alzheimer’s disease. I know that Maurine will always be grateful for the comfort that Molly provided for her mother. 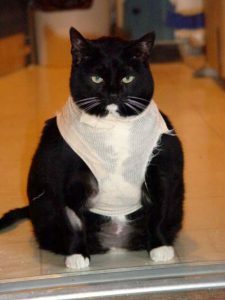 Some of you may have seen Bennie on my Feline Obesity page. 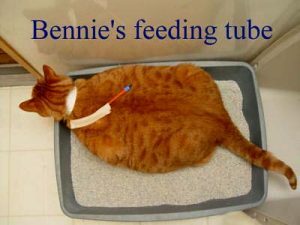 Bennie had his feeding tube in for about 5 weeks. I only used it for the first 2-3 weeks but I kept it in for another ~2 weeks just to make sure that he was going to eat well on his own. When it came time to feed him, he would crawl in my lap and purr away. He was not bothered by the tube at all and would play like a normal cat during the 5 weeks that the tube was in place. This is not a very good movie but it was the best that I could do without help. The next two pictures were taken just a few hours after Bennie had the feeding tube put in. As you can see, he is none the worse for wear after his trip to the clinic which also included a dental cleaning – which I always do if I have any of my cats under general anesthesia. As soon as I brought him home from the clinic and gave him a meal through his tube, he was much brighter and more alert than he had been prior to the tube placement. After his first feeding, he rolled over for a belly rub. 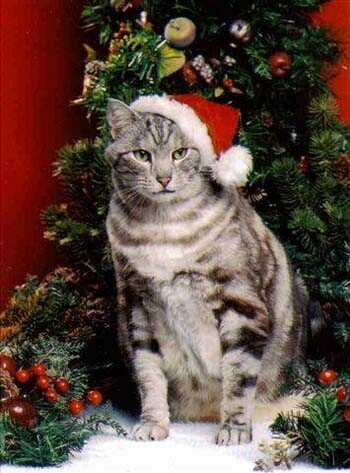 And finally, my much loved Sundance….. Even though these are not good pictures of a PEG tube, I had to put them on this page to honor my precious boy. I rescued Sundance from the ‘euthanize list’ at our local shelter. He weighed a nice 10 pounds at the time. He was then adopted out to what I thought was a loving home but the people returned him to me 2 years later as an emaciated 4.5 pound cat. They had not sought any veterinary care for what turned out to be lymphoma. I immediately put a PEG tube in him and within a couple of months he returned to a robust 10 pounds of pure love. Unfortunately, Sundance lost his battle with cancer and I had to put him to sleep which darn near killed me. I still cry over him and that was 10 years ago…. You can see the PEG tube port near Sundance’s shoulder. This tube went directly into his stomach entering from the left side just behind the ribcage. Sundance was never bothered by this tube and lived a fairly normal life for the 3-4 months that it was in. I do want to comment that if the diagnosis of terminal lymphoma would have been made prior to the tube placement, I would have opted for euthanasia rather than to prolong the inevitable with a feeding tube. This is because he was experiencing occasional severe pain when eating. The lymphoma was in his head/sinus area which made it hard to diagnose. If your veterinarian recommends a feeding tube for your sick kitty, please do not hesitate to utilize this life-saving tool.